(Quebec) While his teammates were still celebrating the Stanley Cup they won the week before, the Los Angeles Kings forward, Simon Gagne, was on a surgery table. The June 18th, he underwent a surgery to remove a mass in his neck the size of a tennis ball. For the #12 the procedure could be the answer to the pain he felt in the last few seasons. 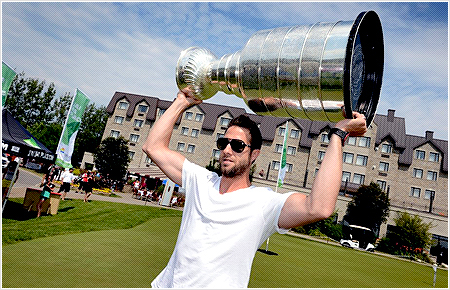 For three years, Simon Gagne was living with this mass in his neck. Neither Flyers nor Lighning doctors dared to touch it. Ironically, it was another injury he suffered on December 26th, that forced the best Los Angeles specialists to look further. “Because I was already injured, they [the LA doctors] decided to not take any chances and treated my injury like it was a concussion and they made tests. After 5 months, they realized that a surgery was possible, with a chance of a full recovery, with no subsequent issues. It’s been already 3 weeks and I’m feeling really good. I’m very happy I did it. After all, we have the Stanley Cup. So it’s #1!” Happily said the left winger, who was enjoying his day with the precious trophy. The mass they took out of Gagne’s neck was a tissue accumulation, caused by multiple hits he got. It was probably the reason of his chronic pain, for a long time blamed on concussions. All the tests made them realize it was, in fact, a “capsule” which could be removed without any risks. Since the surgery, the hockey player’s life changed radically. “For 2 years, I had a lot of problems. I was taking a lot of medications to ease the pain and feel comfortable. In the mornings, it was painful and stiff. Like I was suffering from a stiff-neck everyday. The first year, it wasn’t so bad. But after 2 or 3 years, 365 days per year, when you wake up with pain, it’s become really bothering,” he admited. For a moment, he even thought his career was over. But it took an unexpected turn. The Kings’ forward finally could come back to play, just in time to play in 4 Stanley Cup Final games against the Devils, allowing his name to be on the Stanley Cup. source: Le Soleil; big thank you to my friend Véro for the translation from French! GREAT NEWS!!! Hope you have an awesome 2012/2013 season . You look great with the cup. Fantastic news Simon, We here in L.A. and surrounding counties feel you are awesome!!! and can’t wait to see you healthy and skating 100%. Be confident you are loved here as a KING and we appreciate you and your hard work. I am very pleased to see you hoist the cup with us and hope to see you do it gain. Have a quick recovery and we will be watching for you in October. GKG. I’m still thrilled that you play for LA, and I love watching you skate – so graceful yet so dangerous. Hey Simon! Your ability to come back and play in the Finals was truly inspiring. I am glad that you were able to win the Cup with my favorite team, the KINGS! I hope that next year can be just as memorable. You did it Simon! The Cup is yours and so awesome to see you hoisting it in the pic above. On behalf of almost all Flyers fans (some as you know are pricks for pricks sake) we miss you and wish you only the best. Glad the surgery was successful and enjoy the rest of your summer. Look forward to a great season from you in 2012.
p.s Playing NHL 2012 with #12 in your honor. You were and always will be one of the greatest Flyers!